BEWARE BEFORE YOU SIGN IRS FORM 4506 !!!! Home loan borrowers across the country should be on the lookout for misuse of a key federal income tax form that many lenders are now routinely asking mortgage applicants to sign before settlement. The document, IRS FORM 4506, empowers its holder to obtain transcripts of four or more years of your federal income tax filings directly from the IRS. 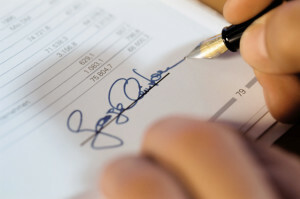 Once this form has been signed by a mortgage applicant, according to the IRS, there are no controls over who sees your tax returns, what is done with them, or how long they can be retained or redistributed. The problem with Form 4506, is that lenders increasingly are requiring borrowers to fill out the document as a condition of obtaining a home mortgage. Some applicants never see the form until they’re at settlement, when they’re told they must sign. The fine print on form 4506, indicates that “based upon the form, the IRS will release the tax information requested to any party show on line 5.” Most of the time this line is left blank. Hence, anyone can make a copy and enter their name on line 5; even the porter. The fine print also indicated that no matter who was listed on line 5, the form would only be valid for 60 calendar days after the date next to the applicants signatures. Most of the time the date is left out. According to many settlement agents, they stated that the lenders specifically request that the date be left blank. In effect, borrowers are asked to sign away the rights to four years of their most private financial information to unknown parties for an indefinite period of time. The purpose of Form 4506 is to be a service to creditors who want to independently confirm loan applicant’s income data for the prevention of fraud by the applicant. If you don’t want your tax returns to be floating around – potentially in cyberspace – simply refuse to go along with 11th. hour demands that you sign a 4506 covering years unrelated to your loan application. Don’t be afraid to walk out. There are plenty of other loans, and lots of other lenders.